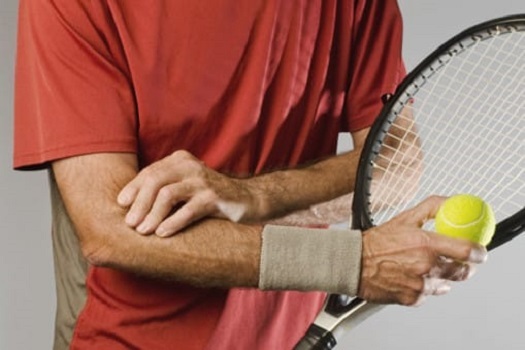 Tennis elbow (lateral epicondylitis) and Golfers elbow (medial epicondylitis) are common conditions and are not limited to people who play sports. Epicondylitis is a tendinopathy, that is a condition affecting tendons that causes pain, especially near where the tendon attaches to bone. Tennis elbow (lateral epicondylitis) and Golfers elbow (medial epicondylitis) are common conditions and are not limited to people who play sports. Epicondylitis is a tendinopathy, that is a condition affecting tendons that causes pain, especially near where the tendon attaches to bone. Xrays are usually normal though tendon changes can be shown by ultrasound or MRI scans. Treatment initially will involve rest, physiotherapy and sometimes steroid (cortisone) injections. If symptoms are persistent other treatment such as shockwave (ultrasound) treatment can be used. Fortunately these conditions will usually resolve and surgery is only rarely required.